Postural problems develop over time; months and years of poor ergonomics, sitting at a computer working or just surfing all day. This leads to altered biomechanics and stress on joints, discs, muscles and nerves. While correcting posture is requires a long term commitment, for those who don’t want to wait long for relief from postural neck, upper back and headache pain, there are some things you can do for posture first aid that can help fast. We have discussed posture correction in detail. Many factors go into this. Proper ergonomics when sleeping, working, and at leisure is essential. I often get questions of what can be done to alleviate the pain fast. Well, there are no quick fixes; you must approach it from a long term perspective. Changing the negative effects of poor posture takes time. The most frequent question is which of your products can I use that will help fast? I have to stress that you should not rely on posture first aid (quick fixes using posture correcting products), however there are some products you can use as first aid for posture relief. Poor sitting posture has many negative effects. The imbalance of joints causes limitations of motion for muscles and tendons, making beneficial movements like exercise more difficult. The stress, imbalance, altered function not only causes problems in appearance, but can cause pain and related disability. Correcting poor posture is a very important part of maintaining a healthy life. One of the main problems that can cause neck pain, upper back pain and headaches is a forward posture of the head. This results in muscles that become overstretched, while others become weak. 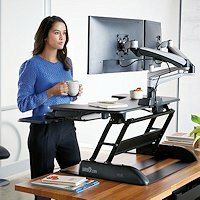 The advice of “sit up straight” is great, but fades fast when you are working at a computer. Computers have become so common at work and home, especially now effecting younger people. Children as well as teenagers are spending more and more time working with a computer, sitting at a desk. This requires long periods of seated posture, making it difficult to stay in correct posture. According to habits we tend to alter postures, such as crossing the legs and slouching. When bad postures start becoming a habit early in life, adaptation can occur, where these postures are felt as comfortable. Over a period of time, deformations in body structures result in strain on the bones, discs, joints, tendons and muscles. Combine this with things like carrying heavy schoolbags, lack of exercise, and maintaining these postures when watching TV or studying, it is unlikely we will see a decline in muculoskeletal problems in the future. As you can see from the pictures, a common problem is rounded shoulders and the scapula rotating forward. 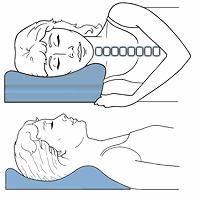 This stretches the muscles of the upper back and help to form what we sometimes call an “upper crossed syndrome”. This affects the muscles in the upper back, shoulders, and neck. A 2016 study in the journal Physical Therapy Science indicates a program of strengthening and stretching to be effective for upper crossed syndrome. Janda MD. in Orthopedic physical assessment, 5th ed. St. Louis: Sauders, 2007 indicates that typical forward head posture (FHP) is due to this upper crossed syndrome and it results from slouched sitting postures sustained for prolonged periods. While we emphasize a multifactoral approach; ergonomic seating and working, posture oriented stretching and strengthening, joint therapy and corrective sleeping pillows; there are some quick fixes to help that we call “posture first aid”. 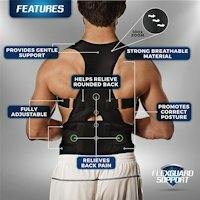 I frequently get the question, “I sit at a computer all day and get a lot of pain, which of your products can help?” I always have to stress the importance of a comprehensive approach, however, I like the PostureMedic Posture Brace for immediate support and correction. 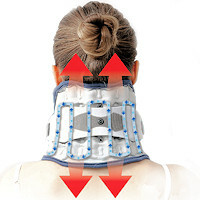 Just using the brace can help to reverse slumped posture and is a constant reminder to use good posture. It helps train the brain to reverse the crossed syndrome effect. Additionally, it can be used as a muscle training device, helping to strengthen specific weak postural muscles. This is a great first aid tool, especially for those with upper back problems or pain between the shoulders. Another group of products that can provide some postural first aid are inflatable traction collars. In addition to the benefits of decompressing cervical spine structures, these collars can help foster better posture. They can be worn while sitting, working or at leisure to relieve pressure. You get to control the amount of lift and there are models that you can control left and right sides individually, making a custom fit easy. Chair Supports can be a good first aid tool. They come in many styles and designs; but all from simple to complex, inexpensive and expensive, for just the lower back to the entire spine, can provide some immediate relief and help relax sore muscles. They can automatically adjust your posture, and some are adjustable for personal preference. Some are small and lightweight, making it easy to transfer from home, to vehicle, to work. Some can turn a simple chair into an ergonomic seated experience. But the least of them can have a positive effect on your posture. The last I will point out is not a product, but a rather simple looking neck stretch/exercise that can be done while sitting and working. We have seen in the upper crossed syndrome how the deep muscles that flex the neck become weak. The problem is these muscles are small and deep in the cervical spine. Although the motion is small, it is a finesse motion to get these muscles to strengthen. It is a nodding type of motion that is done with the head over the shoulders and trying not to use the outer neck muscles. Interestingly, studies indicate it can provide immediate pain relief. The muscles targeted help to maintain the natural curve of the spine. So, the stretch not only can provide immediate posture first aid, it also helps strengthen muscles over time that help to correct posture.